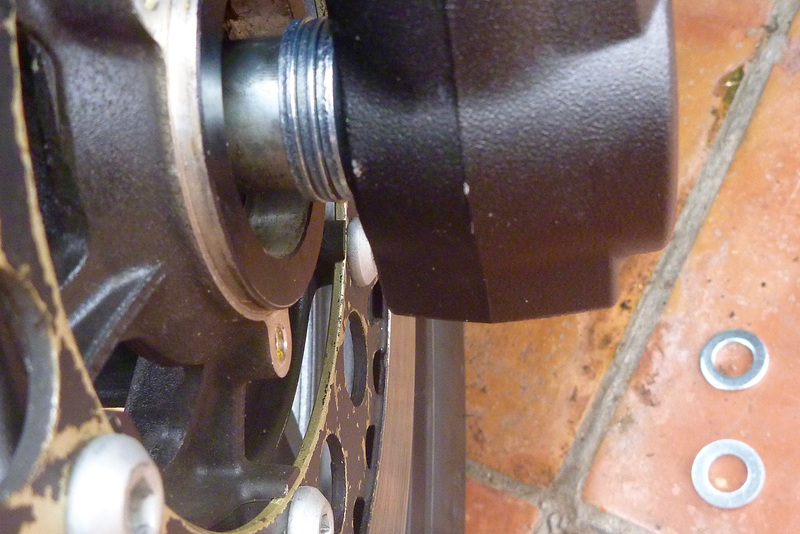 This whole project kicked off by taking a chance on the front wheel of an XV950 V-Star Bolt (left). It’s what Americans call a ‘compatability swap-out’ and the wheel had been sitting on ebay for months; £130 with tyre and one bearing. 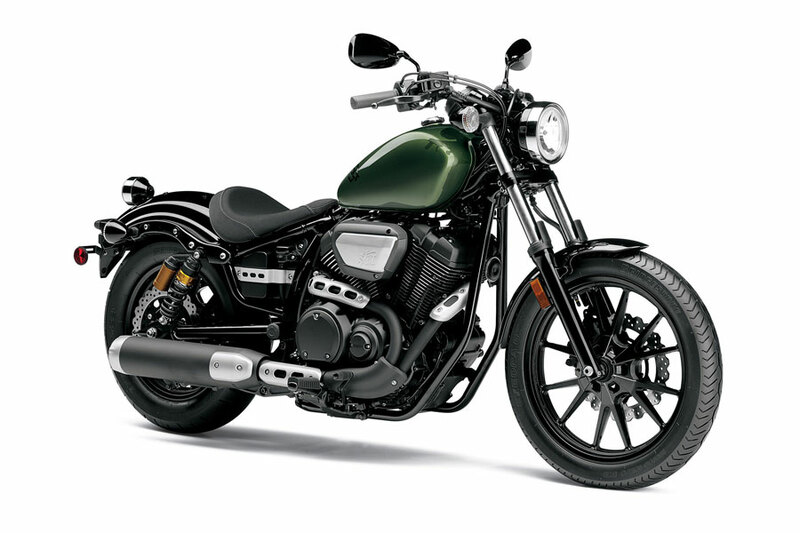 No wonder there were no takers; a V-Bolt is a mock-Sportster – something which proper Brit bikers would probably scoff at (while secretly fancying). They are of course very popular in the US and the recently released, 250-kilo wire-wheeled SCR 950 Scrambler (right) is virtually the same thing, but about as ‘scrambler’ as Triumph’s effort (or mine), and I suspect doomed to low UK sales. The recent Ducatis and BMWs are much cooler. Boredom alert: I learned things the hard way doing all this so go into unusual detail to save others on similar projects from making the same mistakes. An XV runs one, 298mm disc on six bolts. I needed a 282mm-rotor if I was to try and reuse my calipers. Many internet hours passed – distant stars exploded; babies were born; a celebrity sneezed. 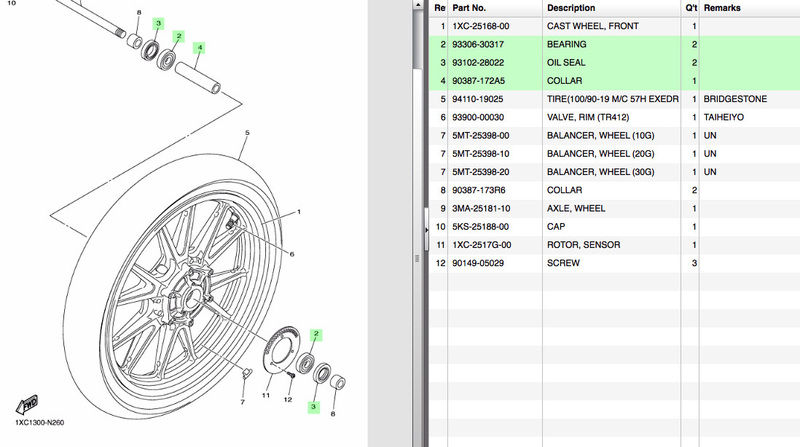 I discovered that FJ1300 and V-Max rear rotors, and good old XT660Z fronts come in 282mm/6 bolt. Cheapest was a V-Max for 40 quid; new OE bolts were another £10. Notice I say ‘disc’ not discs. 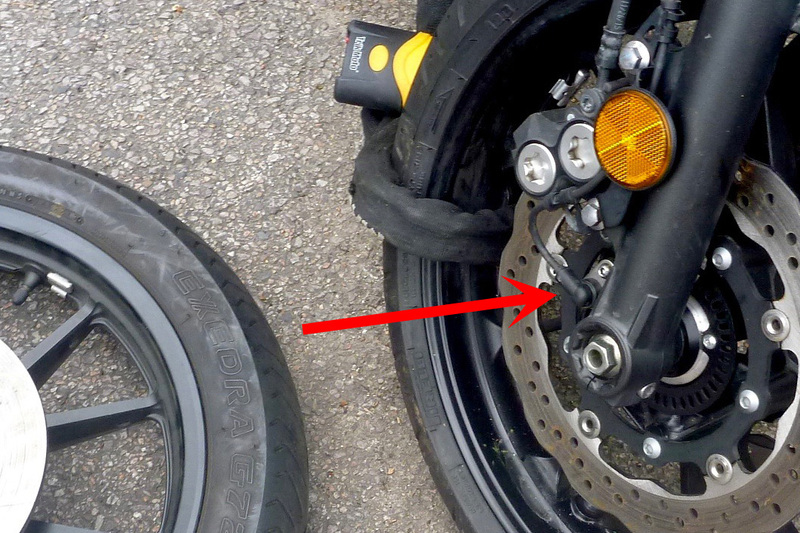 The XSR and many other bikes get unnecessarily fitted with twin discs. It must be some sort of marketing cue which goes over my head and is certainly not related to outright performance. Discontinued XT660Z: twin front rotors; forthcoming T7 with 50% more power: single front rotor; HP2 Enduro/GS12 is another example. No denying it; XSR brakes are great; Bike mag (right) recently logged a Tracer 700 pulling up just as well as high-end sports bikes. On my XSR I believe they’re overkill and add unsprung weight. With a single braided line and 3-4kg saved, the suspension will like it. 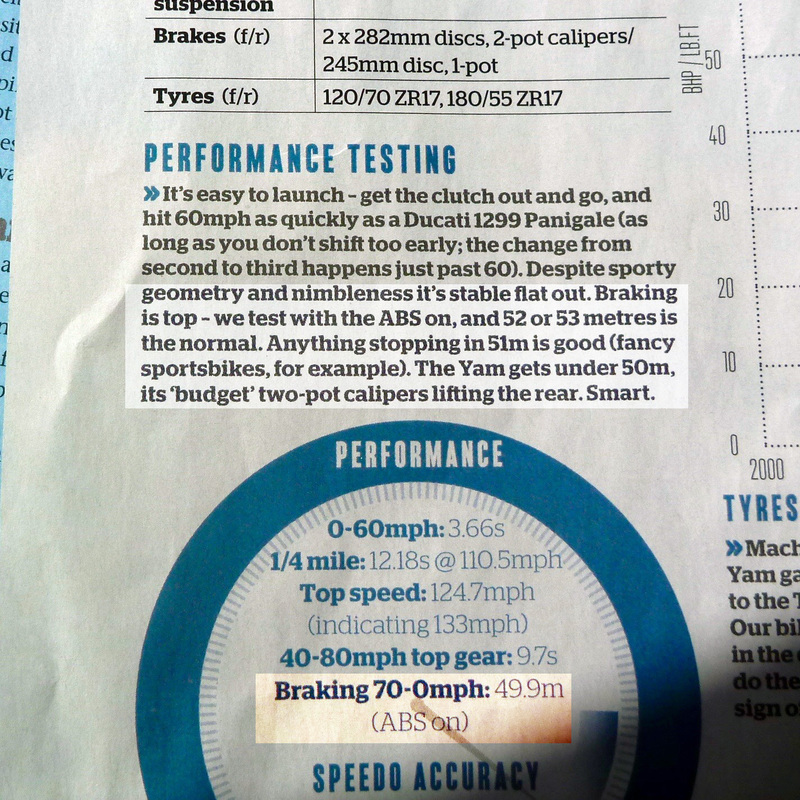 In fact (and annoyingly), the XV wheel is nearly a kilo heavier, even with one disc. Oh well, I’ll save by ditching the second caliper. Getting to the point of removing one wheel to offer up the other had taken quite a while. I live on a hill and have nowhere to work but the street. Luckily a neighbour let me use her back garden if I didn’t mind removing and replacing the alleyway fence. A scan on Gumtree brought up an new trolley jack down the road for 20 quid and at last I was in business. I’ve long known OE bearing prices are an easily dodged scam (see this vid). Down th e Yamaha dealer that’ll be 21 quid for the missing wheel bearing, but this commonly sized bearing is classified as a 6303. 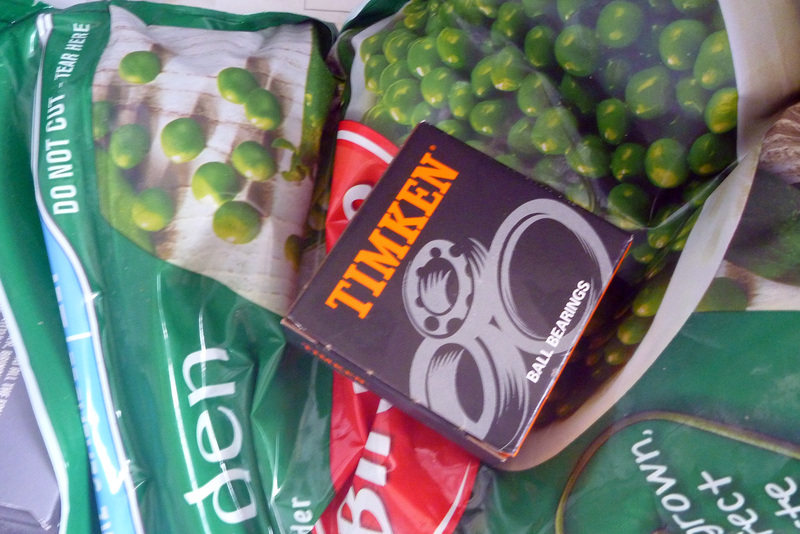 Seven quid for a top-of-the-range Timken jobby (right) from a bearing shop in Croydon, or about the same posted online. 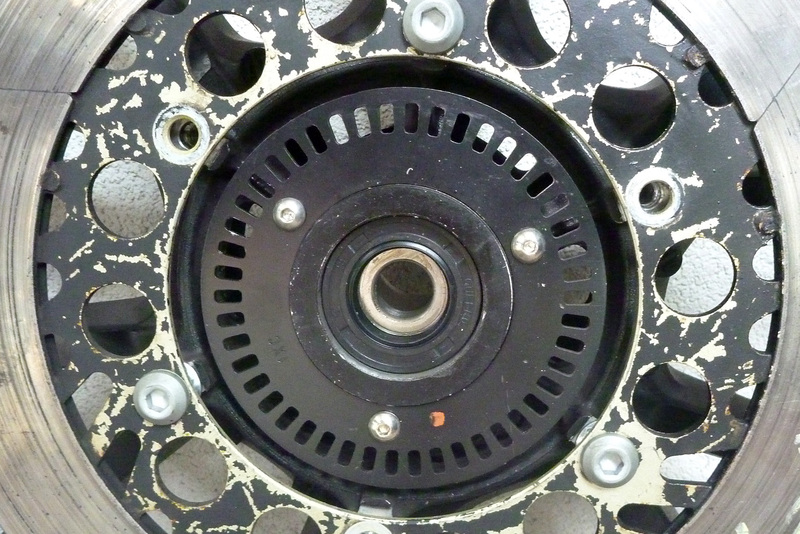 These places might have done dust seals too, but I didn’t want to push my luck; they must match the wheel spacer ø, so that’s a tenner for a pair posted from Wemoto. 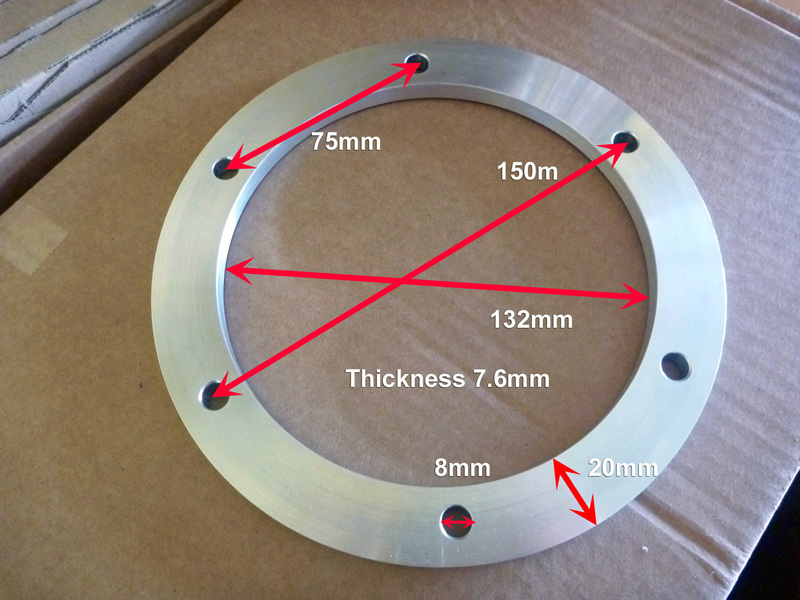 I also needed the in-hub collar/spacer that goes between the bearings. I tried used online but couldn’t find the exact width (fyi: 70mm x 24mm out ø x 17mm in ø) so succumbed to new for £13 posted from Fowlers – the Partzilla of the UK, but without competition-driven discounts. Another ten days pass by. Good video below on wheel bearing removal and installation. With one bearing already installed, I was able to use the spindle as an alignment guide, gently tapping the frozen and greased bearing round the outer edges with a 22mm socket for the final push into the frame heated hub. 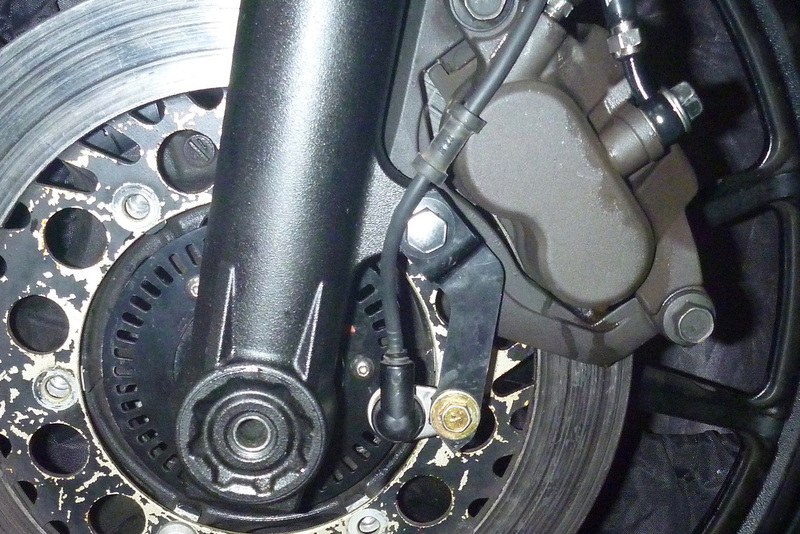 The XSR’s calipers are so fat that you have to remove both to get the fat OE wheel out – never seen that before. 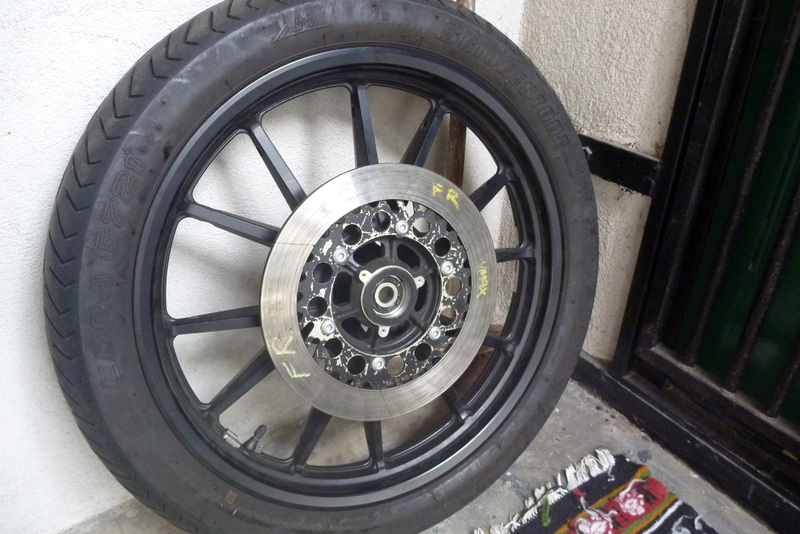 But offer up the XSR rotors with the new wheel loosely in place and – CLANG! 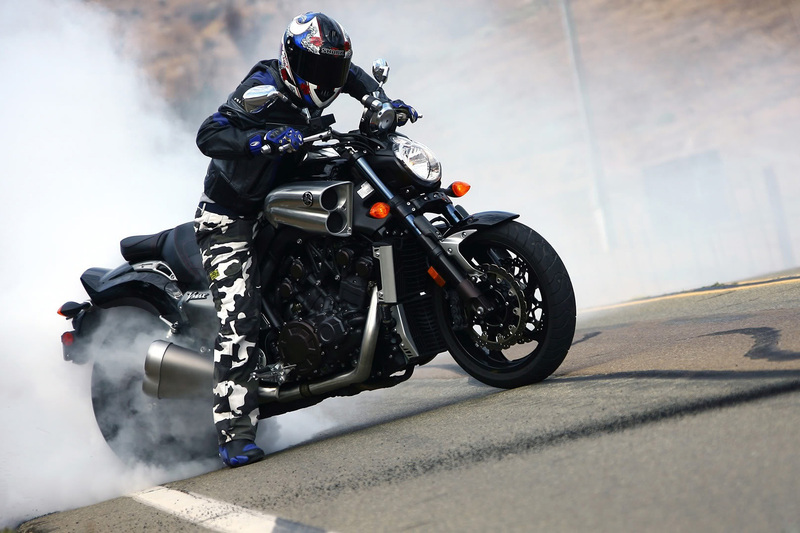 – the 90-mm wide four-pot XSR caliper fouled the XV spokes. Stars exploded, babies were born… and many hours and Photoshop alignment estimates later (right), I decided an XV950 caliper (below right) would probably fit my fork mounts. I tracked one down in Texas for just $25 + the same again in post and tax. Stars… babies… celebrities… Another ten days pass. For a while I’d got hung up trying to track down a used Blue Spot caliper like my TDM900 had. R1s had them too; best brakes I ever did use. But it slowly dawned on me there are two (maybe more?) 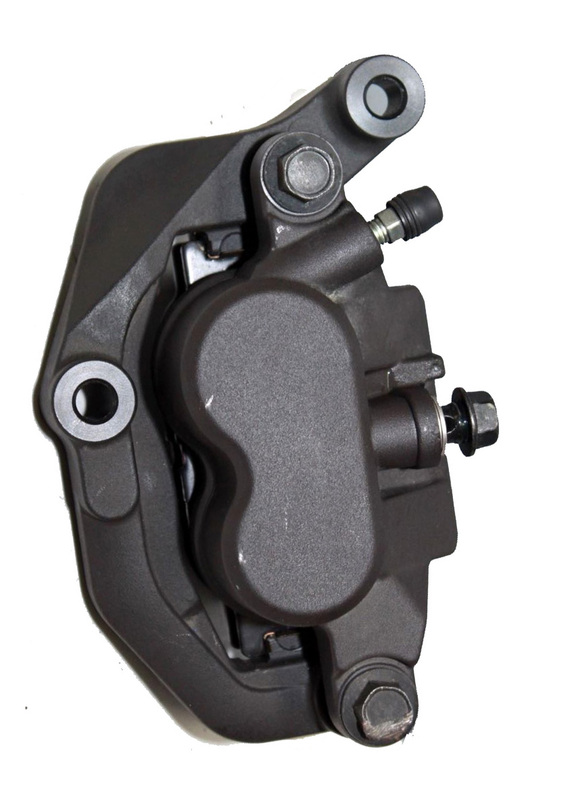 types of Yamaha disc brakes. Your cruisin’ XVs run slimmer, sliding twin-piston calipers (above left). 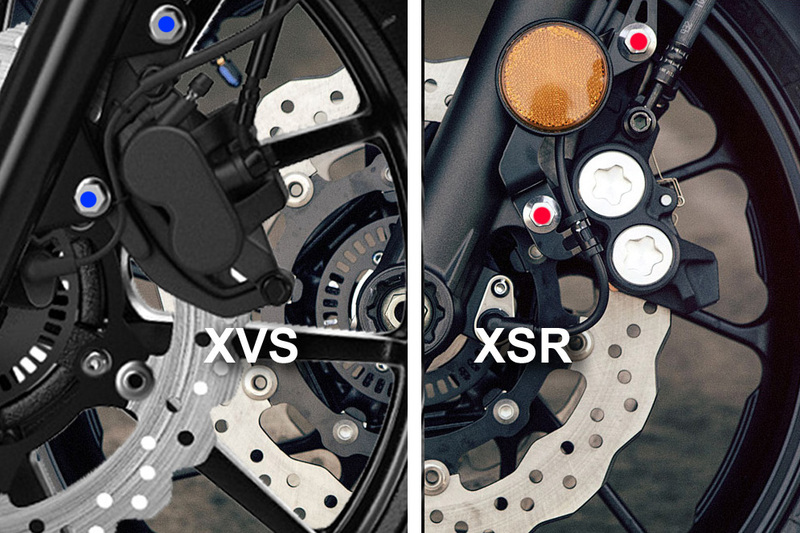 An XSR’s opposed 4-pot unit is Blue Spot in all but name; very powerful but bulky. 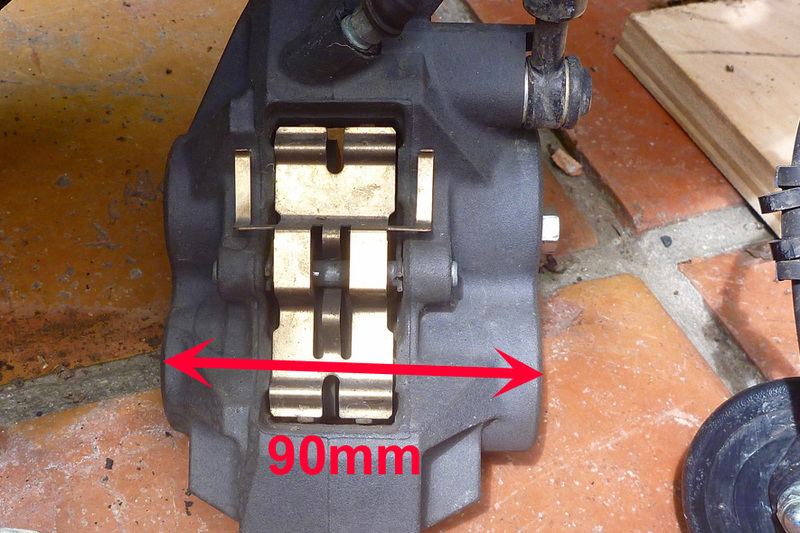 The less powerful sliding-caliper hydraulics are mildly compensated by the larger, 298-mm XV rotor (more retardation). 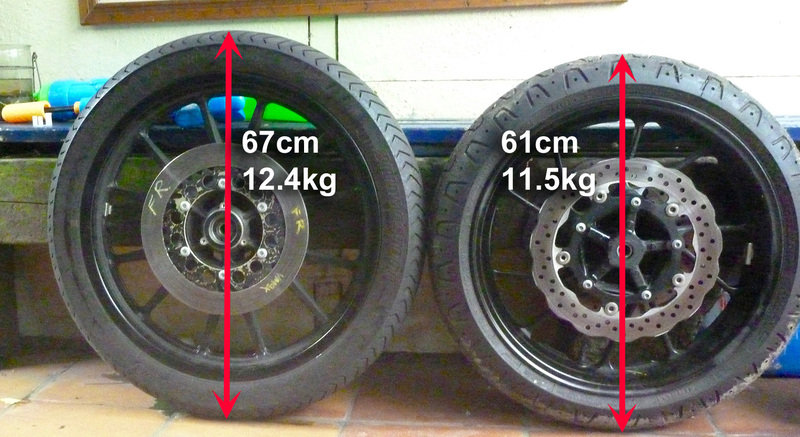 My 284-mil vented V-Max (right) disc is smaller, but my bike is at least 60-kg lighter. All lined up well on the same-diametre 17-mm XSR spindle by adding three and a bit 3mm washers to centre the wheel. 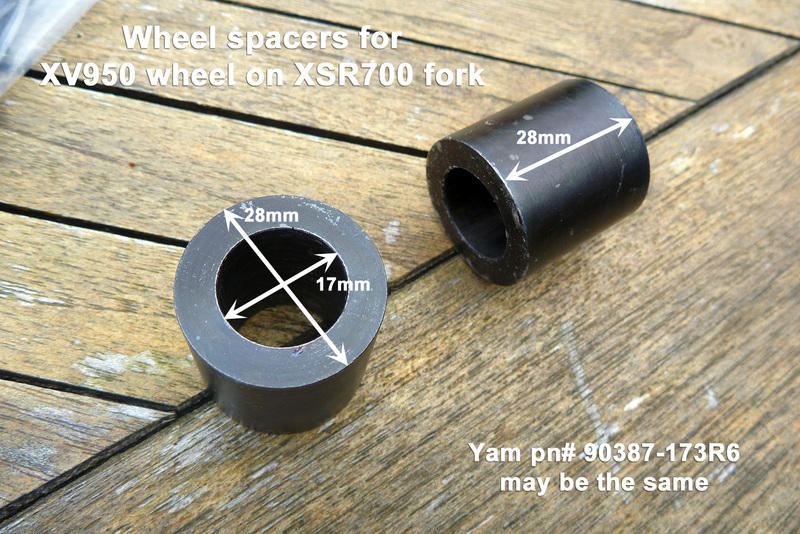 The XSR’s spacers are 20mm ø x 17mm long (with a 17mm bore). What’s needed here is 28 x 28 on 17. Such wheel spacers are probably the same as XV items (see below left for pn) but the only way to find out was buying and waiting another ten days. 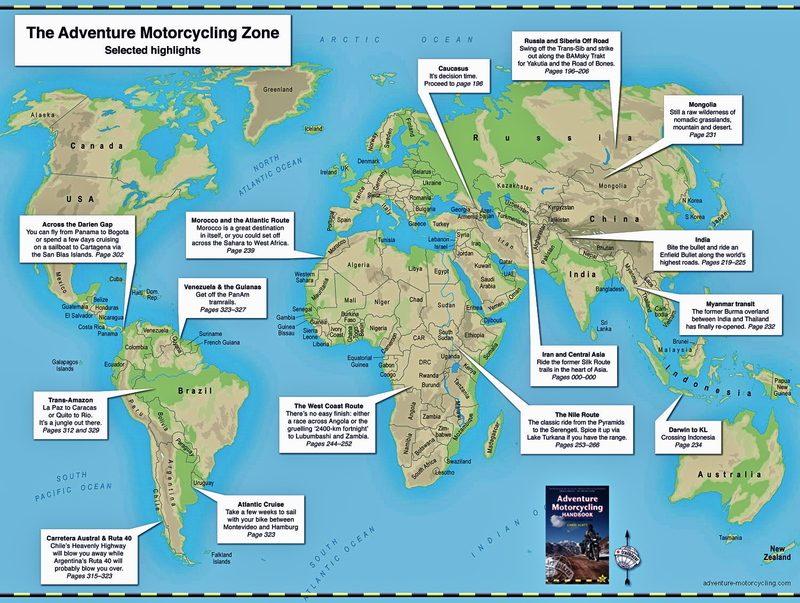 Luckily, Desert Rider Jon is a mate with a lathe who likes this kind of challenge and made them almost overnight. in the caliper’s jaws. Jon is milling one out in alloy for me. So this 7.6mm rotor spacer (right) is just about the only custom part needed to marry up an XVS wheel, spacers and caliper with an XSR fork and a 286mm rotor. 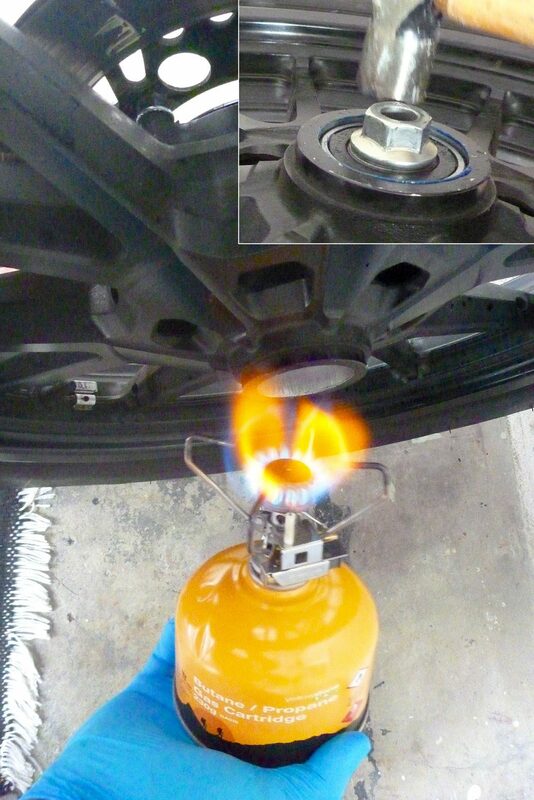 You could use nuts as rotor spacers but I figured a fully surfaced spacer would be better at transferring the heat. Sorting the caliper and spacing was the main challenge in this 19er swap-out. 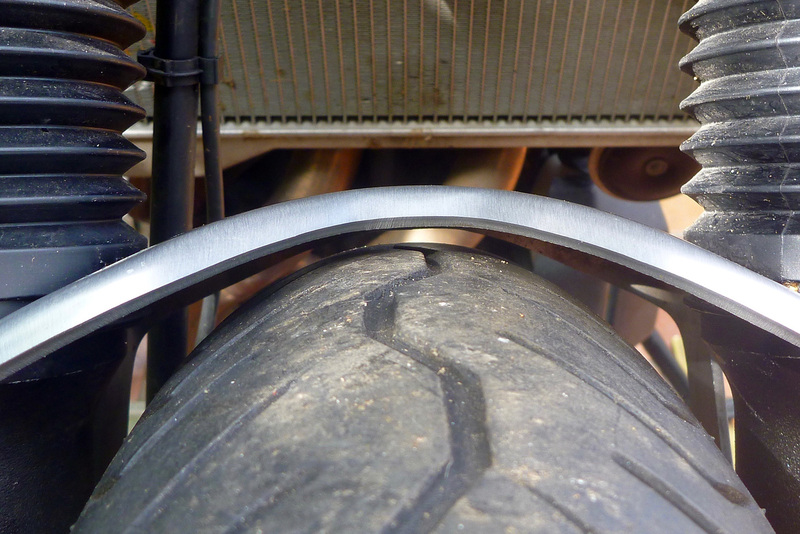 The brace now has only 5mm tyre clearance (left). Mounting the trials guard on top will be easy,but I may get the brace re-done too – also an easy job. Or, with a bit of a nick, I may just bend it in to give it more lift and more curvature to take the rear fender; a plastic universal trials rear for £28 from In Motion. 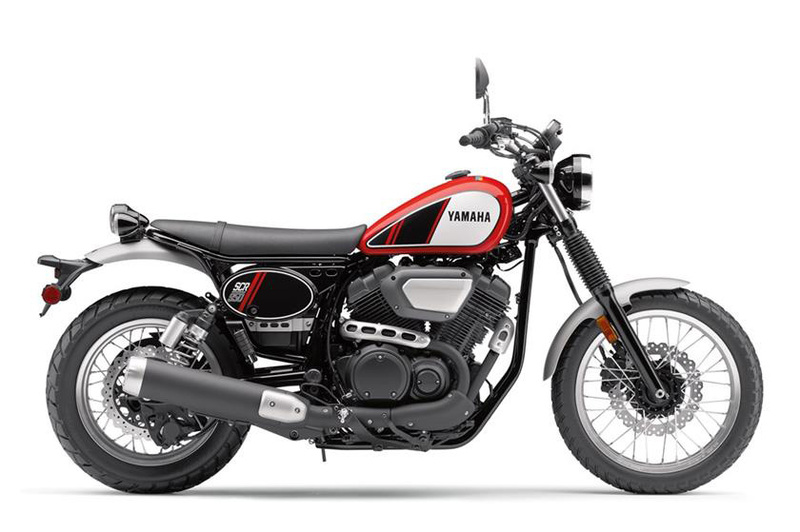 I estimated the tyre to radiator lower edge clearance was 180mm; the forks are said to have 150mm of travel which leaves 30mm; just enough for the slim, plastic mudguard. This trials guard will be way wider than the new tyre so won’t look that great but will sure keep the muck off. Skimpy front fenders are for the beard & tatts brigade. I was now ready to unbolt the XSR brake lines and calipers, feed in and bolt up a single 850-mm braided Venhill brake hose (£30), top up with DOT 4 (£2.99) and bleed. By chance the ABS sensor fitted by reusing a sawn-down reflector bracket (left). Only one washer and no bending required. The XV’s ABS ring (£40 new; £20 used from Germany) is on the disc side and a bit larger than the XSRs (originally on the other side) and in the 400-m ride back to my place it seems the XSR’s ABS computer didn’t like it and the light stayed on. That may take some sorting, but at least I have brakes. Other stuff. I bought a SW Motech ‘spoiler’ (£120) to double up as a sump guard. It’s pretty flimsy in 3mm alloy, and I think after Morocco will be wrecked, but that’s all there is and better a bashed bashplate than an unguarded sump. I may rivet on some more plate. As you can see, I sprayed the front unpainted bit with a few coats of plastic paint (and did the radiator covers while I was it it). As expected, the Motech spoiler didn’t fit around my Akra pipe, but months ago in anticipation I’d bought a ‘sacrificial’ OE pipe off a new bike for just £100. 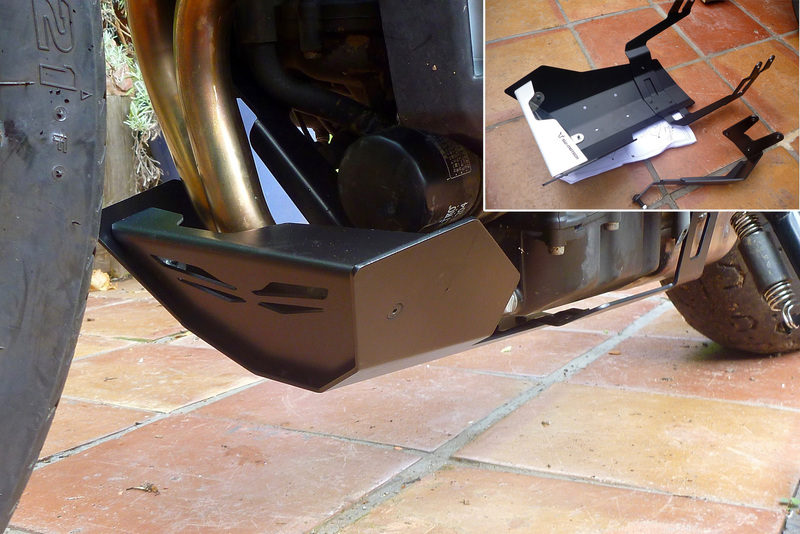 There are heaps on ebay right now (same with shocks) and the under-motor mass makes a good sump guard. Better a bashed cat than an unguarded sump. 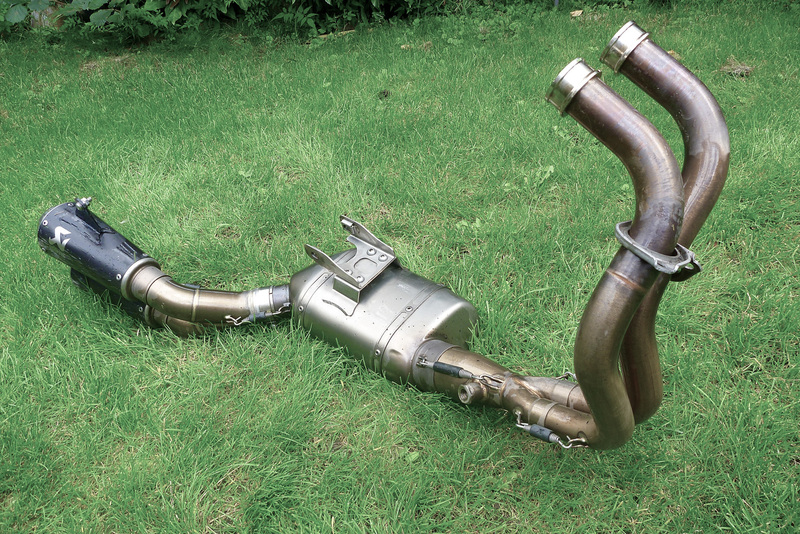 Interestingly, the OE pipe is the same weight (7kg) as the £1100 Akra which is now on ebay. My neighbour’s got her garden back now. Final jobs: fit the rotor spacer and mudguard (maybe a taller fork brace? ); try and sort the ABS light, if needed. 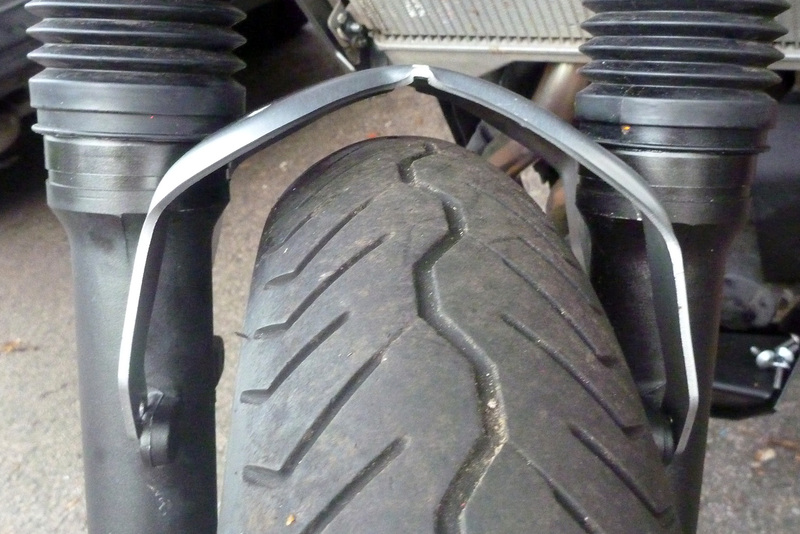 Then take the brakes for a test run and consider a rear shock with a bit of lift, and extend the sidestand to suit. If it all goes or feels wrong it’s all easily reversible. 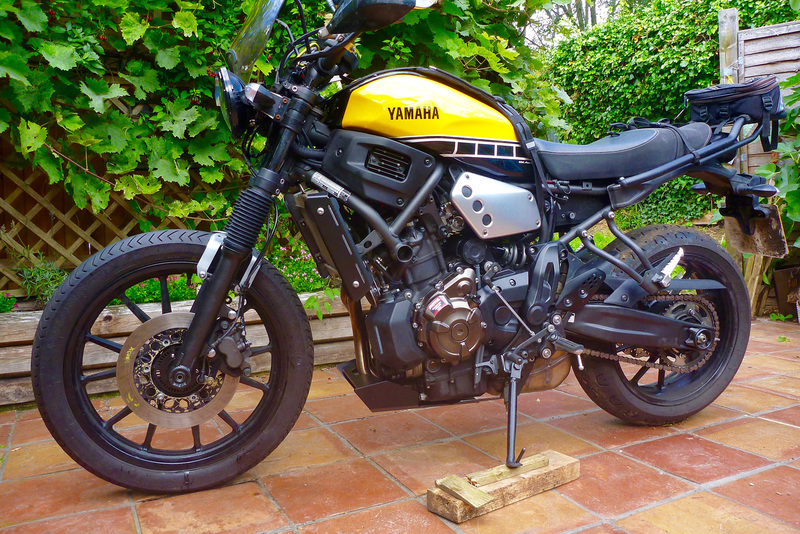 This entry was posted in AMH News, Project Bikes, Project XScrambleR 700 and tagged 19-inch wheel swap, abs sensor, blue spot brakes, compat swap-out, SCR 950 Scrambler, sw motech bashplate, vmax rotor, xsr scrambler, xsr700, XV950 V-Star Bolt. Bookmark the permalink.